Bill Gates just took a bite out of a forbidden fruit. Microsoft's founder has been seen using an iPhone 5s while departing for a philanthropic endeavour, despite his role at the software giant and having a no-Apple-device-allowed policy in his family. Gates's kids were taken by surprise, after asking to use iPhones since 2007 and being told "No", but said they understand and support his choice as Apple's smartphone "is pretty cool". Gates' decision to buy an iPhone 5s, in white with, naturally, a (Product) Red case, was fueled by Bono's taunts, as U2's lead singer repeatedly teased Gates for not being able to beat him at Candy Crush. "I respect Bill. He is a great man who is doing an impressive job at making our world a better place. I only wish I could do half as much as him", said Bono in an interview a month ago. "Yet when I look at my Facebook, I don't see him anywhere close to me in Candy Crush. I'm chuffed. There, I beat him hands down". 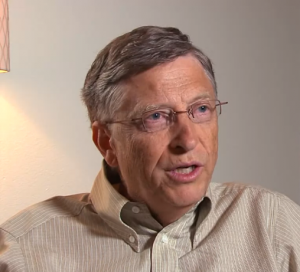 Gates is known to be an avid Candy Crush player in philanthropic circles, but he cannot play the addictive game on his Windows Phone as it is not yet available, and that slows him down. "We will get Candy Crush, soon, as Joe Belfiore tells me the app-gap is a thing of the past for us", said Gates last year, prior to getting the iPhone 5s. Apparently he could not wait any longer, despite the perennial promises that have been made since late-2012. "While I believe Windows Phone is better even though we have not launched any update since 2012, I wanted to see exactly how much better it is compared to an iPhone 5s", says Gates. "I am surprised to say the iPhone 5s gets more use. Windows Phone does not have that many great apps, certainly not as many as Joe Belfiore has lead me to believe. I have been living a lie". When asked what else he likes about the iPhone 5s, Gates said "It's all about the apps. I can access my PC at home with our Microsoft Remote Desktop. Why does Windows Phone not have it yet? Office is amazing to have on the road. Buffer is great for scheduling my social updates on the things I do, Pocket is nice for saving articles on new cures, books, and other interesting reads. I just like the ecosystem", says a blushing Gates. "I even have my fingerprint set up, to keep Melinda from using it". Gates will not ditch Windows Phone as he was just promised "it will get much better soon". But for the time being, he is loving the iPhone 5s. "Why didn't we do something like this in 2007? ", asked Gates, while fondling the smartphone.